THE Rosehaven set in High St should be retained as a tourist attraction, Derwent Valley Councillor James Graham said last week. 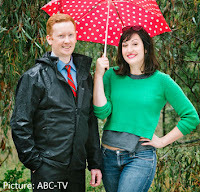 Rosehaven is an eight-part comedy written by Celia Pacquola and Luke McGregor. Tasmanian-born McGregor plays a man who returns home to run his parents' real estate business in the fictitious town of Rosehaven, which through the magic of television will mostly be made up from locations in the Derwent Valley. The production has filmed locally at several places in New Norfolk and Lachlan, initially spending a few days on location in Circle St. There was also great interest when driving scenes were filmed in the Avenues area of New Norfolk North. 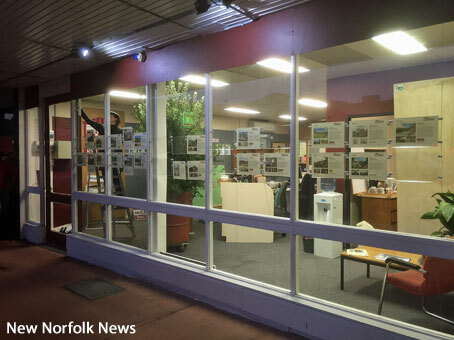 real estate office could be left in place. 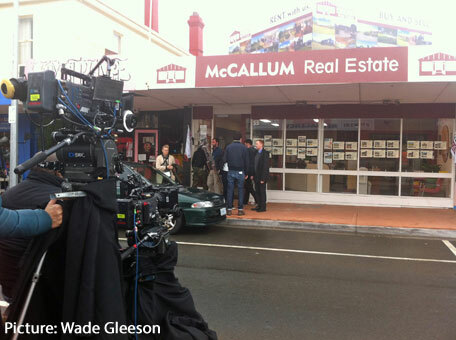 An empty shop at 55 High St has been transformed into the office of "McCallum Real Estate", where two weeks of filming was carried out, including a street protest scene. Cr Graham said there would be many people wanting to see where the ABC-TV comedy series was filmed once it hit the small screen. He suggested that the council could ask for the set to be left in place once the production has wrapped up. The producers are hopeful the first series of Rosehaven - to be aired later this year - will be the start of a long-running flagship comedy on the ABC. 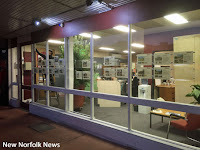 The town of Minyip in Victoria continues to attract fans of the 1980s medical drama The Flying Doctors 25 years after it ceased production, while Pitt Town and surrounds in the Hawkesbury region of New South Wales still offer A Country Practice tours more than two decades after that show ended.